SELANGAU: Minister in the Prime Minister’s Department, Datuk Joseph Entulu Belaun yesterday handed over Minor Rural Project (MRP) grants amounting to RM888,000 to a total of 79 Village Development and Security Committees (JKKKs) in the Selangau Parliamentary Constituency. Minister in the Prime Minister Department, Datuk Joseph Entulu Belaun (left) hands over a MRP grant to a longhouse chief. 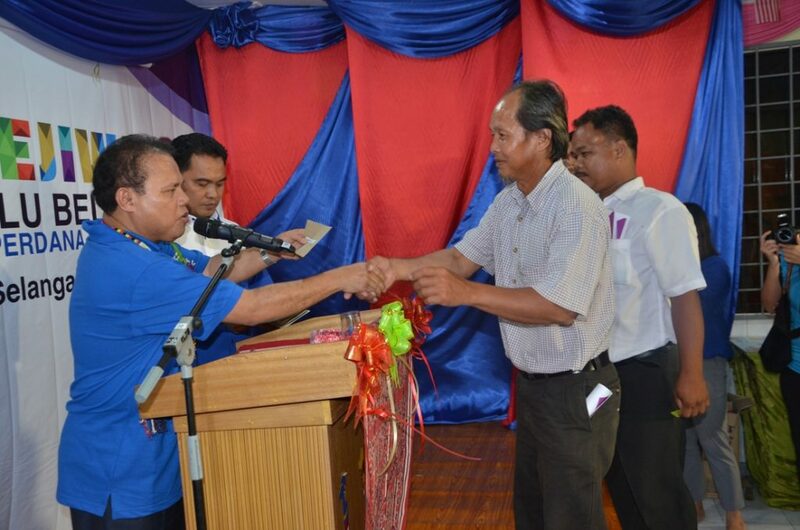 He handed over the MRP grants during a “Sehati Sejiwa” programme held at Jangit Lanting longhouse at Sungai Igu here. Entulu said the programme was a good opportunity for him to hear directly the problems faced by the local people and to find solutions as soon as possible. “The programme also aims to get feedback from the local people on the organising of new programmes in the future,” he said. Entulu said similar programmes were held at Rumah Jarawa, Sungai Plan, Bintulu and Rumah Jalaping, in Tatau, Bintulu in 2016 and at Rumah Assan Ngang in Naga Medamit, Limbang early this year. “I hope such programmes will continue in future in other Divisions as well,” he added. Various activities held during the programme included a career and public service exhibition, the setting up of a public sector job application online counter by the Public Service Commission (PSC) and briefings by PSC, Malaysian Palm Oil Board (MPOB), Sarawak Agriculture Department, National Anti-Drug Agency (AADK), Community Development Department (KEMAS), Malaysian Pepper Board, Fire and Rescue Department, health screening and performances by local singers, Melissa Francis and Urai. Entulu hands over RM888,000 MRP grants 0 out of 5 based on 0 ratings. 0 user reviews.